We (a team of 5 family members plus Koda the Malamute) went to the Arctic Circle via the Dempster Highway, which opened in June 2018. We wanted to do a trip that would take us to wild and remote places seldom traveled. This one fit the bill! 2018 Road trip details: After a trip across British Columbia from West to East on dirt roads and jeep trails a few summers ago, we wanted to go further north next time. We read an article about a new Inuvik to Tuk road. The road, which opens to non-local, non-commercial traffic in June 2018, links the towns of Inuvik and Tuktoyaktuk (AKA Tuk) on a former winter only ice road. Tuk is a small village perched on the Arctic Ocean and is now accessible via the Dempster Highway which starts in the Yukon Territory, near Alaska and heads northeast across the Arctic Circle. We wanted to do a trip that would take us to wild and remote places seldom traveled. This one fits the bill. In the Summer of 2018, my wife, our three children, my brother-in-law and his family, our Alaskan Malamute, and I all trekked from Seattle to the Beaufort Sea in the Canadian Arctic, driving more than 10,000 kilometers over 160 hours of driving and one and a half months. The end result? The trip of a lifetime. Below, I feature trip highlights, points of interest, our route and gear, and how we prepared - or, in hindsight, ought to have prepared. The idea for our Tepui Endless Adventure 2018 trip began in late 2017 after reading about a massive project undertaken by the Canadian Government to convert a winter-only “ice road” stretching from Inuvik to Tuktoyaktuk (AKA Tuk) in the Canadian Northwest Territories into a year-round, dirt and gravel road built atop the permafrost. Although completed in the Fall of 2017, the government did not open the road to non-commercial and non-local traffic until June of 2018. Now open, the route extends the previously existing Trans Canada Trail all the way to the Beaufort Sea on the Arctic Ocean. “How cool would it be to drive all the way up there next summer?” I remarked offhandedly to my wife, Danielle. And, in that moment, our trip was born. Soon, we had covered our dining table with maps as Danielle explored various route options. We would drive all the way to the top of the Canadian arctic in summer! When we learned of Tepui’s Endless Adventure Contest, Danielle entered our trip idea along with a video from our previous Canadian Overlanding trip. Learning the contest had selected us as finalists cemented the plan—we were now committed to what would become the trip of a lifetime. Focus on the Northern Sections- We decided to focus our time in the Canadian Yukon and Northwest Territories. We had never been to the Arctic and we wanted to spend as much time as possible exploring this region of the planet. Although BC is visually stunning and has tremendous features, we had already completed a 3-week traverse of the province two years earlier and, therefore, decided to save further exploration of BC for future adventures. Allow Time for Exploration - We also felt the trip had to offer more than just driving (although there would undoubtedly be a lot of driving!). We aimed to drive an average of 3-4 hours per day. This allowed us to explore a bit more and take in some other activities, including, hiking, paddle-boarding, fly fishing and exploring local communities. To do all of this, we planned to tour for 5 to 7 weeks. Take the Roads Less Traveled- Where possible, we privileged back roads and trails over main highways. We also preferred to camp in unadvertised, unimproved wilderness areas in an effort to immerse ourselves in the adventure as much as possible. Be Prepared and Self-Sufficient- We refused to allow for fuel, food, or inevitable gear or mechanical issues to disrupt our trip, so we prioritized extra supplies, tools, and spare parts. Our trip started at our home, near Seattle, in Western Washington. We took Highway 1 through lush British Columbia, following the majestic Fraser River Canyon north and up through Prince George, BC. From there, we headed up the Stewart-Cassiar Highway,which traverses 847 km north from its start at Kitimat, BC before crossing the 60th parallel in the Yukon territories and joining the Alaska Highwayand, eventually, Dawson Cityof Klondike Gold Rush fame. From Dawson, we embarked on the fabled Dempster Highwayto the Inuvialuit Hamlet of Inuvik. From Inuvik, we took the new Inuvik-Tuktoyaktuk Highway(ITH) to the Arctic Ocean. We spent the day in Tuk before returning to Inuvik for the Great Northern Arts Festival. We then drove back down through Dawson City again to Prince George, engaging Stewart, closed roads, Keno City, South Canol Road and a number of forest fires along the way. From Prince George, we proceeded east to Revelstoke, B.C. along some out-of-service forest service roads and unimproved logging roads for a few days as a “shortcut.” By the way, I would not recommend this route for stock 4x4s, as the rough trails broke two rear shock mounts and blew out a rear shock in our Defender 90. To address this, I removed both shocks completely, as they were dangling and completely broken off their upper mounts. Needless to say, subsequently driving on the highway with no rear dampening offered quite an adventure, as the truck porpoised severely on every undulation of the road, resulting in some rather exciting harmonics, as you might imagine. For the most part, we avoided campgrounds, opting instead for wilderness bivouac sites whenever possible. We generally found these sites by using a GPS, paper maps, satellite images, or by scouting trails off the main roads. This approach takes a bit longer, as many side trails are either washed-out, gated, overgrown, or feature no trespassing signs. If you choose this approach, please respect private or First Nations lands, and, of course, leave no trace behind. We saw bears, moose, and fox. We caught lake trout, walleye, and arctic grayling. Many nights, we camped on lakes and rivers that we had entirely to ourselves. We braved cold, heat, dust, rough route conditions, and biting insects. We overcame multiple mechanical issues, including a windshield destroyed by a rock, a dead alternator, a broken thermostat, a disconnected panhard rod, an overheating transmission from towing up steep logging trails, and sheared-off axle lugs. In the end, however, through ingenuity, perseverance and, perhaps, a bit of luck, we safely made it to the Arctic Circle and back. Of course, traveling to wild and remote areas requires a bit more preparation than a typical road trip. Here are some things to consider should you decide to do so. Much of the route is off-pavement. 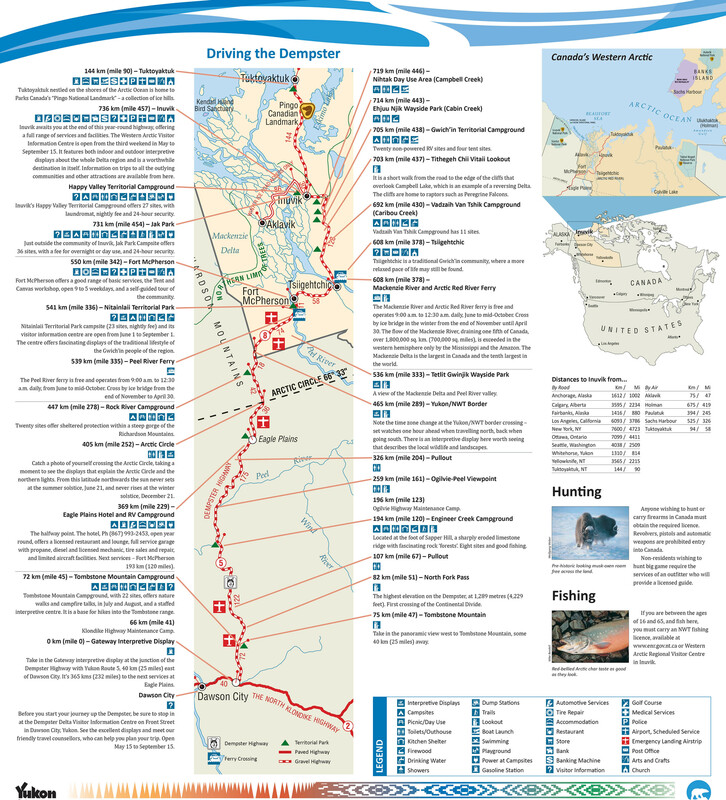 Even the “main roads”, such as the Dempster Highway, the South Canol Road, and the Inuvik-Tuktoyaktuk Highway feature dirt and gravel and are prone to slides, washouts, mud, and rutting in severe weather. Road conditions vary widely -- sometimes affording speedy travel at 100 clicks or more, and sometimes closing the roads entirely, especially after rains. Though the Canadian government does an incredible job maintaining these roads, Mother Nature works around the clock with rains, shifting permafrost, etc. to thwart their efforts. On our trip, routes sometimes became rutted, greasy with mud, or loose with gravel. 2WD vehicles often had to slow down or even stop to meet challenges posed by changing conditions. Additionally, should you choose to pursue more remote camping, as we did, you will find most spots accessible only by 4WD with sufficient clearance. For our trip we had three outstanding workhorses: an RHD diesel Land Rover Defender 90, a 2016 Toyota Tacoma, and a 2018 Jeep Wrangler Rubicon JL. Without a doubt, roof top tents proved to be the trip’s true MVPs. Because we chose to camp away from campgrounds, we often found ourselves on rough and uneven terrain. Thankfully, the terrain proved to be a non-issue because we could simply pop the roof top tents. At best, ground tents would have meant sleeping on huge rocks and, in the worst case, would have proved entirely infeasible. With its capacity to reflect heat, the aluminized Baja Tent added an extra level of protection against the temperature extremes we encountered. Of particular note, we experienced a 60-degree variation in temperatures over the trip. Because comfort stops appear less frequently the further north one gets, one cannot always find ice for one’s cooler. It is, therefore, imperative that one purchase a high-end cooler, like the one furnished to us by Yeti, which kept our food cold and enabled us to go many days without an ice refill. We topped our Land Rover Defender 90 with a Tepui Lightning Hardshelltent. With its narrow track and short wheel base, good for tight turn-arounds and narrow trails, we tended to use the Defender as a scout vehicle to explore faint trails off of main roads and to find camp spots. In many cases, these faint trails featured downed trees and lots of brush. The Tepui Lightning Hardshell tent fit perfectly atop the Land Rover, especially as its durable, hard shell easily withstood abuse from brush and branches. Additionally, our Tepui Awning offered respite from the frequent rains that pelted us early in the trip. Later, as we reached the Land of the Never-Setting-Sun, the awning provided relief from temperatures that routinely rose into the 90s. Our awning also came with a very handy detachable screen room that we employed at campsites in defense against various biting insects. This fantastic combination is a must have for serious adventurers travelling to this region during the relentless Arctic bug season. If you have an older vehicle, or a rare model, be sure to bring enough spare parts to address things that commonly tend to fail. Also, bring service items, such as air filters and any fluids with unique specifications that you might need for your vehicle. You’ll likely need to change your oil and air filter at least once during the trip. You might also consider protecting your lights and leading edges of body paint with protective film because of the rocks and stones and may need to protect your radiator from bugs and stones, depending upon its position in the engine compartment. At a bare minimum, definitely carry at least one full-size spare. Make sure that your vehicles feature rugged, multi-ply, all-terrain tires that can withstand jagged stones. Also, watch out for a couple of known problem points for tires, like Rock River and MacKenzie Delta, in particular. Ideally, for safety, travel with more than one vehicle in case of an unanticipated mechanical failure. Along similar lines, ensure you have a basic set of tools and a baseline mechanic knowledge, as you never know when something like a thermostat or an alternator might go. I cannot emphasize this point enough. You will be so remote that you simply will not have mechanic support. Thus, some level of mechanical self-sufficiency is really helpful – if not absolutely essential. To reiterate, you simply must be prepared with the equipment and knowhow to extricate vehicle if it becomes stuck while exploring. For this reason, packing recovery gear, such as traction boards, a winch, tree straps, etc. is essential, should your vehicle become stuck. I would also encourage you to follow leave-no-trace principles, as well. Last, consider bear safety. Keep a clean camp and store food in your locked vehicle. Being off the ground in a roof top tent also makes everyone feel a bit safer in serious bear country. For more information on bear safety, see this link. Come prepared with both paper maps and electronic GPS. If you are planning on using seasonal or forest service roads, verify BC road closures before you go at drivebc.ca. For paper maps, BC Backroads Map Books can’t be beat. You should also think about a vehicle-to-vehicle communication when out of cell phone range – which includes most of the trip. CB radios, GMRS or FRS radios can make coordination for bathroom stops or food breaks a lot easier. If you plan to take forest service roads in BC, you will need to carry a portable ham radio and radio in when traveling on active logging roads. Logging trucks often travel at high speeds down the center of narrow dirt roads. Radio control prevents accidents. Forest Service Road Signs feature RR Channels; you can download the table of frequencies on this website. Ultimately, if you plan to travel off main roads or to camp outside established campsites, you simply must understand and follow BC Forestry radio procedures. The tundra is very fragile. Thus, you must not leave trash or piles of toilet paper. We used a Thunderboxcollapsible toilet. The NWT and YT governments also provide bear-proof trash containers at rest stops. Please use them. Spare tire trash containers are not recommended for long-term storage of food waste or packaging, as it tends to attract bears. Regardless of the season – including summer – you must prepare for temperature extremes in the YT and NWT. For example, we routinely experienced 60 degree temperature swings— with lows in the 30s at night, daytime lows in the 40s, and highs in the 90s in July and August. Throughout the trip, you will undoubtedly encounter gnats, mosquitoes of various sizes, beetles that bite, and at least three different types of biting flies. Generally, the bugs are worst in late spring and early summer and begin to taper off after mid-July. The severity of their impact varies greatly, however, as some spots and times of the day are quite bad and others just fine. Keep deet handy, but also bring non-deet natural products, as they often provide adequate protection. We also relied upon ad head nets and bug suits a handful of times. In terms of timing, although you could do it more quickly, we recommend allowing for at least a month and, ideally, 5 to 8 weeks. You can, of course, traverse the route more quickly, but you’ll just be driving and won’t have much time to relax, explore, and enjoy the sites. You must also prepare for unplanned stops for road closures or maintenance. If you plan on taking forest service roads or trails through BC, plan for alternate routes in case of fire or road closures, especially after mid-July. The South Canol Roadoffers a stunningly beautiful route through mountains, as it follows lakes and creeks for 286 miles. Great for camping and fishing, we recommend this route for 4x4 only, as its 286 miles offers no services. Dawson Cityis most definitely the most charming stop along the route. It features significant historic interest and an authentic Old West feel while offering a number of excellent restaurants, coffee shops, a museum, and Visitor’s Center. Stewart-Hyder- Stewart, BC is an Old West, Canadian-US border town, founded over 100 years ago during the mining boom era. Nestled in a gorgeous fjord-like setting on the Portland Canal, which connects the region to the Pacific Ocean, from here you can venture to nearby Hyder, Alaska to take advantage of park-like viewing decks to see the Salmon Glacier and watch bears feeding on returning salmon. The dirt roads leading to the glacier are generally passable by car, but one can also engage in some fun trail driving, as you can see from our picture. The Ripley Creek Innand Lodge offers homey, eclectic lodging in a cluster of old homes dating back to the silver mining boom. Toastworks Restaurant offers the best breakfast we found on the trip. Keno City is another historic and still operating silver mining town. Be sure to stop at the Visitor’s Center on the Dempster, as well as the museum at the end of the Silver Trail in Keno City. You should also take the drive up to the top of Keno Hill. Whitehorse, YT, the largest city you will encounter on the trip, is a great place to restock, resupply, etc. This is also where you will find a new windshield (which is common on this trip) or supplies or services for any other serious repair for your vehicle. You really need to check out “Hot Doggin It” for tasty elk sausages available at a little, nondescript roadside stand just south of Pelly Crossing. We almost didn't stop because it didn’t look like much but, thankfully, we were hungry. What we found was a variety of artisan-made elk sausages made with a wide range of various ingredients, including garlic, blueberries, etc. This is a great and quick stop for road trip food. Tombstone Territorial Park- Imagine Yosemite without roads, people or even trails! Huge granite peaks erupt out of the tundra, providing spectacular scenery. Yes - this park actually encourages off trail hiking because there is so much terrain and so few trails. At a minimum, definitely make time for the Visitor’s Center and a hike. If you have more time, you can backpack a bit through truly sublime terrain. Not seeing all of the great Visitor Centers & Museums. Whether First Nations, Territorial, or municipal, the centers we managed to visit were all excellent and staffed with friendly, helpful people. Not making time to visit Nahaani National Park in the Yukon Territories. Not spending more time in Revelstoke, BC.